If you are doing business and haven’t heard about customization by now, maybe you should look for another career or alternatively join the The World Congress on Mass Customization and Personalization in Hong Kong this fall. Today’s consumers demand the ability to tailor products and services after their individual needs and preferences. They customize and personalize everything, from software (with different plug-ins and skins), to cell phone covers and web browsers. Media consumers are getting more and more used to customize their news consumption, so if you are a media company and assume or demand that all readers use the same tools and desire the same information you aren’t paying attention. You don’t have the right version of browser. Click on the logos below to download a new version or click here if you still want to view Vecko-Revyn’s website. 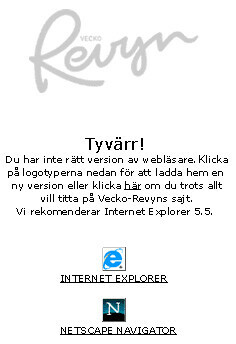 We recommend Internet Explorer 5.5. I beg to differ. Only I decide if I have the right browser or not and you’d better have a pretty darn important website if I should choose to upgrade or switch browser just to visit you. If I was a webmaster I would try to make my website accessible for as many types of browsers as possible. Heard of Firefox maybe? Footnote: I use Netscape from home.